A line of EtherCAT modules with single/dual axis universal drives. The UDMnt supports motors rated up to 500W with peak power of up to 1000W. It is offered with the following current levels: 2.5/5A, 5/10A and 10/20A (cont./peak). 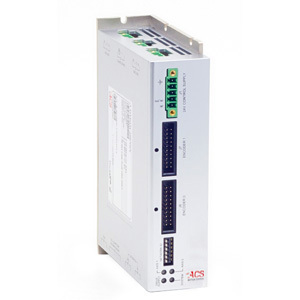 It is powered by a DC voltage of up to 60Vdc for the motor bus voltage, and by a separate 24Vdc logic supply that keeps all logic signals alive during emergency conditions.